Directions: Write the episode mission below in the "Episode Mission" box of your Episode 8 Lesson Chronicles. ​I can write a persuasive essay arguing whether an industrialist was a captain of industry or robber baron. Directions: Read about Captains of Industry and Robber Barons below. A captain of industry is defined as a business leader that benefits the nation in a positive way. This includes increasing the availability of goods, creating more and new jobs, and donating money to benefit the well being of the people. The motives of big business leaders were wealth and power. Some think these powerful business men should be referred to as robber barons. This view defines them in a negative way. They would be described as cruel and ruthless business men who would stop at nothing to achieve great wealth. The robber barons were accused of exploiting (to treat unfairly and use for selfish purposes) workers and forcing horrible working conditions and unfair labor practices upon the workers. They displayed their great wealth in their opulent lifestyle while their workers lived in poor run down tenements or company towns. Another view of the big business leader is that of a captain of industry. This term describes these powerful business men as ingenious (inventive skill and imagination) and industrious (hard working) leaders who transformed the American economy with their business skills. They were praised for these skills as well as for their philanthropy (charity). The way that you see the industrialists is your point of view. Your point of view is the way you see or understand things based on what you know and the experiences you've had. 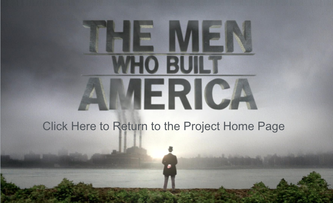 You have now seen all 8 episodes of, The Men Who Built America. What is your point of view about each of these industrialists? ​Were the founders of American industry, Robber Barons, who were bad for America? ​Were the founders of American industry, Captains of Industry, who were good for America? There is a process to writing a persuasive essay and this lesson will take you through each step in the process. The first thing that you must do when you write a persuasive essay is brainstorm. Brainstorm means you jot ideas that are not necesarily in any order. The goal is to simply get ideas on paper so that you can figure out how you want to organize them later. Directions: The first thing you need to do is choose an industrialist as the focus of your essay. 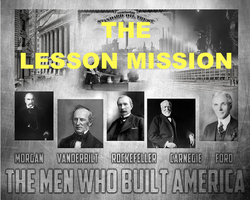 Choose one of the following: Cornelius Vanderbilt, John D. Rockefeller, Andrew Carnegie, J.P. Morgan, and Henry Ford. Write his name under the Brainstorming Header of your Writing Packet. Directions: Choosing a point of view is not always easy. Sometimes you just know. Other times, it is hard to determine. In any case, it is a good idea to compile lists of the different options. In this paper you have two options. You are trying to decide whether an industrialist was a Robber Baron or Captain of Industry. So, the first thing we need to do is list the characteristics of each type. Look at the chart below. It is also in your writing packet. For each statement, list examples of how your industrialist did what is stated. You may not be able to think of a lot of examples for all of them, but all of them should have at least one example. Use your Episode Chronicles 1 - 8 to help you remember. Directions: Look at all the examples you gave in the Evaluating Point of View Chart Above. What impact did each example that you provided, have on the American people? 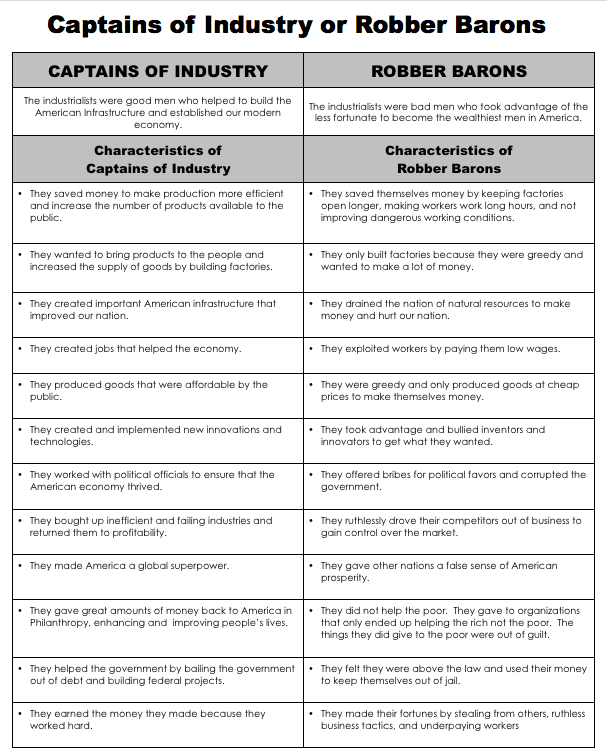 Place an X on The Robber Baron/Captain of Industry Spectrum for each example. So, if you gave an example of how your industrialist made his fortune by stealing from others (the last Robber Baron Characteristic) and your industrialist hurt a great number of people by doing this, then you want t place your X for that example very close if not on Very Bad, Robber Baron - The darkest shade. If, what he did really did not hurt anyone, then you would put it on a lighter shade on the Robber Baron side of the spectrum. After you have an X on the spectrum for every example you gave, look at the spectrum. Where do most of the "X's" lie? 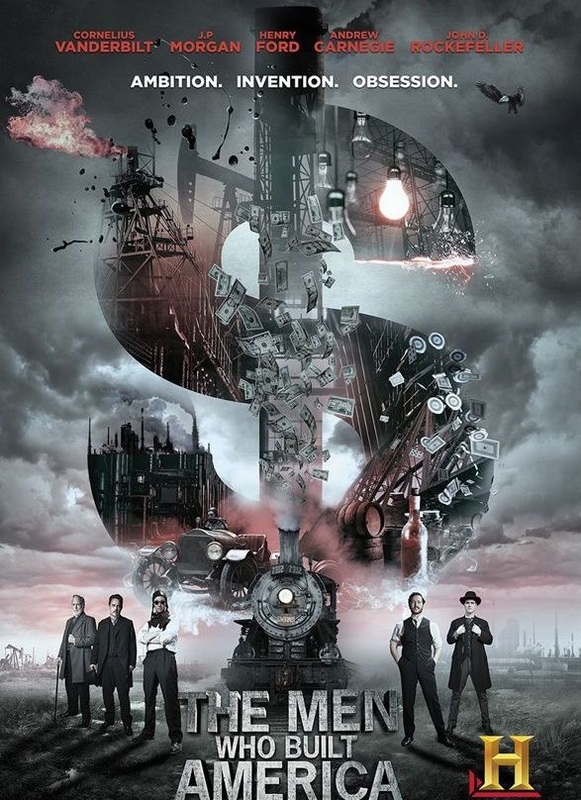 Are they on the Robber Baron side or Captain of Industry Side? Once you have counted, you have your answer. Write your answer on the My Point of View Line in your Packet. Directions: Will be continued after the Holiday Break! MAKING YOUR POINT SOUND REALLY GOOD! FINISHING THE ESSAY & MAKING SURE YOU WROTE IT WELL! Directions: Congratulations! You have completed the the Men Who Built America Project and Essay. Click on the icon below to go back to the Project Homepage.